Right from the formal suit of the US president to the costumes of actors and actresses in movies, Fashion Designers are the professionals who develop clothing that resonates with the prevalent culture. Apart from having a keen sense of colour i.e. combination of shades and tones, visual imagination & knowledge of market trends, fashion designers need to be artistic, creative and must possess ability to translate ideas in sketches. Basic educational qualification for a course in fashion designing is 10+2 from any stream, it varies depending on the course chosen. A host of countries offer fashion designing courses for students. This translates into a steady demand for fashionable clothing and accessories which in turn mean that a steady influx of creative people is required. Europe is the epicenter of the fashion industry. The chance to learn new stuff is immense but one should have the right aptitude for it. The job of a fashion designer may seem glamorous but in reality that is only 10% of the work. The remaining time is spent in sweaty factories, working endlessly on fabrics or accessories. Long hours are put in cleaning, machining and sewing fabrics to get the uber cool look. In order to get admission into a Fashion college in India, students should first clear the entrance exam, which would check their aptitude and eagerness towards that course. The test would either be a DAT – Design Aptitude Test or GAT – General Aptitude Test. Fashion designers can find employment with professional designers as apprentices, with manufacturing units, export houses, boutiques, media as costume designers, freelancing for fashion houses and boutiques and at the same time it is a rewarding possibility for self-employment by opening your own boutique. Graduates in fashion design can work with apparel manufacturers, designers, wholesalers, leather companies, boutiques, jewellery houses, importers and many major and independent retailers. People who love glamour can opt for jobs like fashion photography and costume designers. After gaining experience, people start and run their own ventures. What kind of companies do you work for? There are some department stores, like Shoppers Stop or Lifestyle retail, that hire in-house fashion designers. While it is similar to working for a high-end fashion house, these designers do not own any of their work and cannot sell it to anyone else. Working freelance involves selling garments directly to boutiques and shops, or selling designs to fashion houses and clothing manufacturers. Here, the garment is a finished product. Another avenue of employment is corporations like airlines, hotels and other large entities that have specific uniforms required for their large numbers of employees. Fashion designers are utilized for the new uniform designs. Toy companies also hire fashion designers. The most famous fashion icon being the Barbie doll. 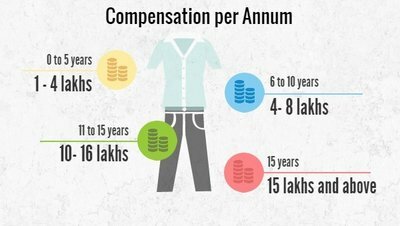 Remuneration in the fashion industry has no upper limit. Fresh graduates start out at less salary but once you find your foothold, name, fame and moolah start raining on you. So bring out the creative monster and spin your magic because the gravy train is loaded guys! You will be a harbinger of change, especially when introducing new designs and styles in clothes. This career allows you to be wildly creative and it encourages you to push boundaries and tread new design ideas. Look at Satyapaul’s creations. Weird to some but they still sell like hot cakes. If you have a penchant for clothing and designing something using your own brand of style, then you will definitely find your place in the fashion industry. Fashion design can give you the opportunity to make a profitable and famous business, if you happen to come up with a successful clothing line. Fashion design is filled with people who are highly critical when it comes to choosing who actually brought something new. What you may think as the best design concept may not be aesthetically pleasing to many. So develop a thick skin as people may not be kind to you. You need to be very patient and hardworking for that big break you are longing for. Behind all the glamour, there is a constant and never ending hardwork along with the possibility that your style may just not hit it right with your target audience. Confused about which career to take? Know which career is best for you?